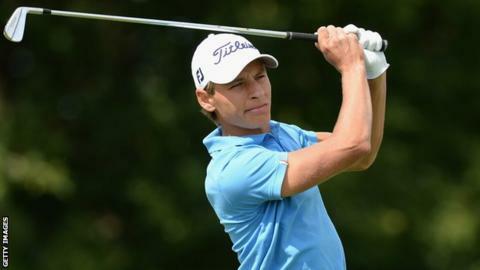 Swede Joakim Lagergren hit a nine-under-par course record 62 to take a two-shot lead after day one at the Northern Ireland Open Challenge event. After starting his round at the 10th, Lagergren, 22, posted nine birdies in a blemish-free card at Galgorm Castle. Frenchman Anthony Snobeck fired a 64 with Clandeboye man Jonathan Caldwell sharing third place after a 65. Michael Hoey needed an eagle at the last to finish on 71 with Gareth Shaw and amateur Dermot McElroy on 67. Playing with three-time European Tour winner Johan Edfors who carded a 68, Hoey birdied his opening two holes and after a double bogey at the third appeared back on track at the turn after a birdie at the eighth was followed by an eagle three at the ninth. However, a 47-minute delay in play because of torrential rain unhinged Hoey, 35, as he was forced to remain at the 10th tee because of the downpour. On his resumption, the Northern Irish star immediately found water with his tee-shot and his subsequent bogey was followed by two more dropped shots at the tough par-four 11th. Things went from bad to worst for the event's tournament ambassador as further shots were frittered away at the 13th and 16th before his second eagle of the day at the last undid some of the damage. In his first outing as the tournament's ambassador last year, Hoey missed the cut and he will probably need to shoot under par on Friday to avoid the same fate. "I just totally lost concentration and my rhythm," said Hoey ruefully after his round. "I got things back a little bit at the end with the eagle which gives me a chance to try and get and get up the leaderboard tomorrow." His playing partner Edfors, operating this season on the Challenge circuit after losing his main tour card last year, produced a slow start and was one over after seven following dropped shots at short holes, the fifth and seventh. Four successive birdies from the eighth saw the Swede, 38, move to three under and he finished on that mark after bogeys at the 14th and 17th were followed by him matching Hoey's final-hole eagle. That left Edfors sharing 16th place, six behind his compatriot Lagergren, who fired a sensational round. Stockholm native Lagergren is currently only 117th in the Challenge Tour rankings but a brilliant putting performance helped him produce a round which at one stage looked like it might even go sub-60. "I have been playing really good the last couple of weeks but the putting hasn't been going so well. Today I holed a few putts which gave me the momentum," Lagergren told BBC Sport. England's Steven Brown is sharing third place with Caldwell after a 65 with two of his compatriots Ross McGowan and Max Orrin a further shot back alongside American Dodge Kemmer. Of the other Northern Ireland hopefuls, Alan Dunbar and Irish Amateur Champion John Ross Galbraith both carded a one-under 70s with Ardglass amateur Cormac Sharvin and Damien Mooney finishing on one over. Derry man Ruaidhri McGee had to retire early during his opening round because of illness. McGee started his round with a double-bogey seven at the 10th and then called a halt after the 15th following two other bogeys.